In the world of coding, the only constant is change. Codes change, regulations change, technologies change. The list goes on. Virtually nothing stays the same for too long. As a result, coder certification and education programs must evolve commensurate with these changes to ensure graduates are well prepared for a demanding—and dynamic—work environment. Programs that remain stagnant do a disservice to the next generation of coders who must be prepared to wear many hats and accomplish multiple tasks in the brave new world of ICD-10. The continued spotlight on the coding profession has inspired many coder training and certification providers to reevaluate priorities, supplement content, and offer varying methods of delivery. This article explores eight trends in coder education that will play a prominent role throughout the remainder of 2016 and beyond to meet the challenging demands of today's health care environment. As compliance regulations continue to intensify and evolve, coder training must include regular touch points to assess competency. Doing so ensures coders maintain accuracy standards and are fully prepared for continual industry changes. For example, coder training provider The Medical Management Institute (MMI) requires an annual retest to ensure ongoing competence. The retest measures coders' knowledge of important CPT, HCPCS, and ICD-10-CM code changes across all specialty areas. In addition to maintaining 12 CEUs annually, those with MMI's registered medical coder (RMC) credential must also obtain a passing score of 76% or higher on the initial and annual certification exams. "Being held accountable yearly with the annual recertification exam helps coders stay current on changes," says Trish Creech, RMC, RMA, RMM, RMB, CAC, CPT, an MMI student and insurance reimbursement coordinator at a university teaching facility in Kentucky. Given the anatomical specificity inherent in ICD-10, many coder training providers have ramped up content in this area—going above and beyond what was offered in the past. Coders must have an in-depth clinical knowledge to be successful with ICD-10-CM and ICD-10-PCS, in particular. Today's coders must possess a big-picture view of the revenue cycle, including its front end (ie, documentation creation/input) as well as its back end (ie, denials and appeals). When coders possess a front-to-back understanding of the revenue cycle, they can articulate the implications of the codes they assign—and know how to improve compliance prospectively. • telemedicine coding and billing. In this fast-paced era of technology, students can obtain a quality education from virtually anywhere in the world, including from the comfort of their own home. Online training modules have become increasingly popular because learning is often self-paced, providing students with more flexibility. In addition, many coders already work remotely, making it easier to create a learning environment within their home. Also, the online medium is familiar thanks to coders' comfort levels working with EHRs. "With onsite training classes, there is a lot of downtime that gets away from the lesson," Creech says. "I prefer online training because it takes less time to complete, you can work the course around your schedule, and you don't need to worry about missing a class or catching up. The online course makes all the material available to you with the click of a mouse." For these reasons, self-paced and interactive online coding courses that prepare coders for the RMC credential are among the most popular among students. • Travel costs sometimes exceed registration costs for the actual training event. • When coders are out of the office, there is a lag in coding and billing, causing accounts receivable backlogs. 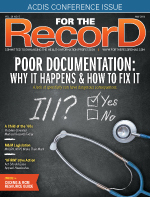 Backlogged coding disrupts cash flow during a time when all providers are vulnerable to ICD-10 denials and delayed payments. In addition to coding, many CDI courses also are moving online. As with coding courses that reflect evolving industry topics, many online CDI courses are moving beyond complications and comorbidities (CCs) and major CCs capture to cover legal matters, physician report cards, external monitoring, and evidence-based clinical documentation. • constant feedback mechanisms regarding grades and/or progress. As students progress through online programs, many education providers have realized that students want—and need—ongoing support via phone or e-mail as questions arise. This "beyond the classroom" support is a critical part of ensuring students have the best opportunity to succeed. As the national coder shortage continues, training providers have begun reaching out to and assisting second-career professionals, many of whom have a health care background, so they can make the transition into coding and other HIM roles. This unique population requires training that capitalizes on the skills these individuals already possess. To help new graduates gain work experience, AHIMA has launched a registered apprenticeship program that reflects new federal investments in skills and job training. This trend is likely to grow as industry demand for qualified coders continues to outweigh supply. As providers become more specialized, many are seeking coders with a similar specialization in coding. This is particularly true given the complexity of ICD-10-PCS, which requires a specialized knowledge of anatomy and physiology. More specialty certifications are likely to emerge, along with specific competency requirements for those specialties. In addition to being sensitive to the needs of second-career professionals, many training providers have also become aware of cultural needs. Many courses are now offered in a variety of languages. When providing education to offshore coders, trainers must be particularly aware of cultural differences and barriers that could affect the learning experience. These nuances are a critical part of ensuring a dynamic and effective training experience. Hospitals and physician practices rely on certified coders to ensure revenue accuracy, mitigate denials, and enhance specificity—particularly as the industry heads into the last phase of the ICD-10 grace period that concludes October 1, 2016. Without the help and guidance of trained and certified coders, all providers may see an increase in denials for medical necessity and nonspecific codes. The pressure is on to recruit and train individuals who will bring the coding profession to the next level and beyond. Many training providers welcome this challenge and are well on their way toward preparing the workforce of the future. — Julia Scott, RMC, is the director of educational support for The Medical Management Institute, a premier educational organization that provides online medical billing and coding, auditing, management, and ICD-10-CM training and certification.